We’d love your help. Let us know what’s wrong with this preview of God, Me, and Sweet Iced Tea by Rose Chandler Johnson. To ask other readers questions about God, Me, and Sweet Iced Tea, please sign up. With decades of facing challenges as a single mom of six, teacher Rose Johnson has gleaned a wealth of experience. To those blessed enough to read the devotional “God, Me and Sweet Iced Tea,” Rose shares some of the wisdom learned through the fiery trials that have led her to spiritual discernment that is both clear and insightful. The author does not pull any punches when she calls sin, sin, whether it is jealousy, unkindness or a judgmental attitude. She also provides lessons of encouragement With decades of facing challenges as a single mom of six, teacher Rose Johnson has gleaned a wealth of experience. To those blessed enough to read the devotional “God, Me and Sweet Iced Tea,” Rose shares some of the wisdom learned through the fiery trials that have led her to spiritual discernment that is both clear and insightful. The author does not pull any punches when she calls sin, sin, whether it is jealousy, unkindness or a judgmental attitude. She also provides lessons of encouragement to help a reader through the universal trials of life. Her words, crafted with healing and comfort as a mother would teach her child, has a simple message: Following God’s ways leads to a victorious Christian walk. It is a journey with Rose as sweet and lovely as her name. Readers will be blessed! This is by far one of the most beautiful devotionals I’ve ever read. God, Me and Sweet Iced Tea written by Rose Chandler Johnson is a true delight. Each devotional delivers a warm and thoughtful message that inspires a deep connection to the heart of God. Every reading is absolutely useful; especially the questions and prayers that encourage self-reflection and journaling. I was often left wanting more of the wisdom Rose Chandler Johnson imparts with her audience. You will find there are many sp This is by far one of the most beautiful devotionals I’ve ever read. God, Me and Sweet Iced Tea written by Rose Chandler Johnson is a true delight. Each devotional delivers a warm and thoughtful message that inspires a deep connection to the heart of God. Every reading is absolutely useful; especially the questions and prayers that encourage self-reflection and journaling. What a great name for a devotional. Sweet Iced Tea refreshes the body. Like god refreshes our soul. Sweet refreshing devotion each day. What a way to start off the day. Read a little each day a savor over it. Meditate upon it. Rose puts her heart in this book of devotions that are done in a sweet way but packed with God’s word. I like the three different parts of the devotional . first there is Prayer always we should start with prayer then the todays sweet tea moment, and Payer focus. I would recommend this devotional. It will give you a sweet blessing. Okay, there's a lot of excellent devotionals out there, several of which I've used, but there's something about God, Me, and Sweet Iced Tea by Rose Chandler Johnson that just clicks with me. These meditative thoughts have blossomed out of her personal walk over the years, and Rose writes with honesty from a depth of experience and maturity. The subtitle, Experiencing God in the Midst of Everyday Moments, couldn't be more descriptive. Rose states in the introduction that she likes to focus on God showing Himself in everyday things - and since we live in the "ordinary," I think it's when we're able to see God in the every-day things around us that life's most eternal lessons are learned. The purpose of a devotional is to temporarily move our focus from all that demands our time and attention in the world so that we can draw closer to the heart of God, and that is exactly what this collection does. This is not a deep book, nor does it need to be. It's actually a simple book, and therein lies its beauty. The daily format is basically Rose's thoughts, Scripture readings, journaling prompts, and prayer focus. In spite of my best efforts over the years, I struggle with journaling, yet this is something I long to do. Rose makes this the easiest I've ever seen and both her journal prompts and prayer focus are my favorite parts. Now, I'm a southern girl - in fact, I live in the same state as Rose - so I have to say how much I enjoy this southern connection. I share her affinity for sweet iced tea and the way she brings it into intimacy with God. Rose writes that our quiet time is "a time for intimate conversation, like chatting with a friend as you sip a glass of tea or a cup of coffee." I'd like to end with this thought that especially spoke to me, from the "Be Still and Know" meditation . . . In the early evenings, I sat on the deck with a glass of iced tea, watching the clouds float by and listening to the birds. During these times, my soul became quiet and still. I communed with God in my heart and mind. Like the sun bursting from behind the clouds, joy burst into my heart. . . . I experienced a renewed appreciation for who He is, the Creator of the universe and the lover of my soul. I believe God is truly pleased when I practice this Scripture. Be still and know Him. God, Me, and Sweet Iced Tea is a wonderful devotional resource that would be appreciated not only by new believers, but seasoned Christians as well. I personally look forward to slowly working my way through this collection, probably spending more than one day on each. God, Me, and Sweet Iced Tea is indeed drawing me closer to God, and for that I give it 5 stars. Have you ever read devotionals and could feel the heart of the author? This is how it was for me reading Rose Johnson’s devotional God, Me and Sweet Ice Tea. Rose has written a sweet book of devotions that reflect on scripture from God’s Word. Each devotion is about a different scripture, they are very short, it only takes a few minutes to read each one. After each devotion you will find a collection of scripture if you want to read more on the topic for that day. There are lines for journaling and answering questions, there is a prayer, a prayer focus, and Today’s Sweet Tea Moments. Each devotion is three to four pages long. First of all, I love this little book, and it is small enough to slip in your purse and take with you. The devotions deal with issues such as, Resolutions, what the Lord requires from us, complaining, obedience, taming the tongue, perfect peace, a life of service, and this is just a small insight at what is in this special devotional. This is a devotional you can use in several ways. If you only have time for a quick read, you can read just the devotion, or you can take more time to look up the scripture, answer the questions and meditate on what God has for you for that specific day. Either way, you will find this to be a very important book to keep around. And I especially appreciate the way Ms. Rose puts her heart into each thing she writes. As I read this book, I could feel Rose’s love for the Lord and her willingness to serve Him. To me, this is what makes God, Me, and Sweet Ice Tea such a special devotion for you to have. I love my copy, and appreciate Rose Chandler Johnson providing it for me to read and review this book, and the opinions I have expressed her are mine only. I really want to encourage you to check out God, Me, and Sweet Ice Tea and purchase a copy for your library. You will be more than pleased with this wonderful heartwarming devotional. This book feels like author Rose Johnson welcomes you right into her kitchen for a refreshing glass of sweet iced tea while you chat together. Her collection of short devotionals are given with a warm friendliness and transparency. Each devotional includes a verse, journal questions, a daily thought, suggested Bible reading and a prayer. Also included is a prayer focus--a suggestion for prayer that connects with that day's devotional topic. If you like My Daily Bread or other daily dev Refreshing! Settling down with my own glass of iced tea prepared me to drink deeply of Rose Chandler Johnson's lovely book, God, Me and Sweet Ice Tea. Whether you're a read straight through a book kind of person or one who loves to linger long and savor each devotional slowly, Rose's inspirational prose will speak to your heart and soul replenishing everything you need to re-enter the busyness of life refreshed and recharged. Buy one for yourself and one for a friend...they'll thank you for your thoughtfulness! Not too many devotionals I have read lately actually speak to me, I’ve reviewed so many book, but this book does. I really clicked with the author’s style. Great title and great insight with just the right scripture passage to meditate on and a strong dose of authenticity and application from the author. She also includes additional related scripture passages, journaling options, a prayer and thought for the day. I probably would have rated this one higher if I had realized before I opened it that it was a daily devotional book. That's not what I was looking for, so it disappointed just a little, HOWEVER, I think if you used it as intended (ie, as a guide for your personal devotions/Bible Study...including looking at the scripture at the end of the chapters and journaling about the study questions) it would be a great spiritual blessing and catalyst for growth. Each chapter starts with a scripture, then the devotion, then has suggested scripture reading, questions for journaling considerations (with lines for writing), a prayer, Today's Sweet Tea Moment, and a prayer focus. This book is a wonderful, easy to use devotional resource with a daily dose of spiritual encouragement and reflection that will help you draw closer to the heart of God. This devotional is designed to draw you closer to the heart of God. Following the Lord is every moment, every second ~ daily. This devotional is like sitting down with a good friend and sharing life together. As a young mom shares her day, truth is reflected. Sharing hurts and hopes, our directional guide from Scripture leads the way to triumph and caring. Peek in each morning with your Bible and pen close by. Come alongside as Rose shares her heart in practical ways of overcoming lack we may feel with encouragement to look to the Lord daily. Here is a snippet from one devotional day to share with you from Rose's devotional journal. Linger and don't rush through. Whether you enjoy sitting outside on a porch swing or rockers with a friend, or at your kitchen table, you will have a good springboard for your daily journey with God. whoever loses his life for me will find it. I remember the time, some twenty or so years ago, when my little children resolved around me like the planets circle the sun. I felt like I was holding them all in place, but God was holding us all. He was ever present. One especially exhausting day, as I was changing a diaper and hurriedly juggling many tasks, I said aloud in exasperation, "I don't have a life!" Without hesitation, the Lord responded emphatically to my words. In my spirit, I heard: No, you don't have a life. Didn't I tell you that whoever will save his life shall lose it, and whoever will lose his life for My sake shall find it? These words came directly to me, personal and real--interjected into my train of thought by a voice of authority. At that moment I knew the Lord had spoken to me. I realized I was doing exactly what He wanted me to do; I was taking care of the needs of my family. My service to them was not an obligation, but a holy calling--a vocation to serve the needs of those in my care. Jesus became a servant to all, taking on the form of a servant in his earthly life. His service was love in action. His selfless love, for our redemption and God's glory, is a model for all believers. It is with this same spirit that we can dedicate our lives to His service. By doing so, we are strengthened to give of ourselves to others, in our families and beyond, as we go about our everyday lives. Journaling Considerations: Can you think of times when your service to others causes you frustration? Self-pity? What encouraging words would you like to hear at those times? In your own words, describe what Paul means in 1 Corinthians 9:19. Prayer: Dear God, I want to be at your service, doing whatever it is that you have called me to do this day. Strengthen me to serve. Give me the love I need to put into my actions. Show me the tasks you have called me to do, that I may live my life for Your glory. Today's Sweet Tea Moment: What would Jesus do? Prayer Focus: Those who devote their lives to God's service by serving others. Enjoy 52 devotionals and your time together with the Lord. Nothing is wasted with the Lord. As you draw near to Him, you will discover the richness of His Word and His love for you. May you be blessed as His sweet fragrance overflows to others. Rose Chandler Johnson, a Southern girl from a tiny Georgia town, is the author of the devotional blog, Write Moments with God. A devoted Christian and mother of six, she has been a teacher of English and French over the last twenty years. She looks forward to continuing her writing ministry in the years ahead. I liked this devotional. It is NOT a deep study by any means. It is more like the daily bread but with daily questions for journaling. It would be really good for a newer Christian or someone looking for a change, something light and not in depth. Most days that I did this study I did more than one day. I should have completed the study much faster but many days I was just not motivated to read it. Some of the topics were very good reminders and had things that made me think. Some days I wrote a I liked this devotional. It is NOT a deep study by any means. It is more like the daily bread but with daily questions for journaling. It would be really good for a newer Christian or someone looking for a change, something light and not in depth. Most days that I did this study I did more than one day. I should have completed the study much faster but many days I was just not motivated to read it. Some of the topics were very good reminders and had things that made me think. Some days I wrote a lot in my journal. Here is a favorite chapter from the book, “A Life of Service” this chapter had good questions as well. I will not quote the whole chapter... just part of it and the questions that made me write so much. These words came directly to me, personal and real—interjected into my train of thought by a voice of authority. At that moment I knew the Lord had spoken to me. I realized I was doing exactly what he wanted me to do; I was taking care of the needs of my family. My service to them was not an obligation, but a holy calling—a vocation to serve the needs of those in my care. Can you think of times when your service to other causes you frustration? Self Pity? I will not share my answers with you. What would you say to those questions, think on them a minute. When I read Rose Chandler Johnson's "God, Me, and Sweet Iced Tea: Experiencing God in the Midst of Everyday Moments," I was drawn in by three key pieces: her honesty about her struggles, her love of God and her knowledge of His Word, and the set up of the book itself. Rose puts it all out there so her readers can see that she too has struggled with many things in her life. Through her struggles, she has grown personally and in her journey with God. I believe that these hard times and the growth When I read Rose Chandler Johnson's "God, Me, and Sweet Iced Tea: Experiencing God in the Midst of Everyday Moments," I was drawn in by three key pieces: her honesty about her struggles, her love of God and her knowledge of His Word, and the set up of the book itself. Rose puts it all out there so her readers can see that she too has struggled with many things in her life. Through her struggles, she has grown personally and in her journey with God. I believe that these hard times and the growth that followed are two of the things that have put Rose in a position to be able to share her devotions with the world. She is able to share her struggles and her successes and motivate other people who may be in similar situations. She shows the world that nothing can hold you back if you believe in yourself and believe in God. Throughout the entire book, Rose's belief in and love of God is evident. There is not a single page that does not show her love and commitment to Him. When she is in need, she goes to Him. When she is happy, she goes to Him. When she is attempting to better herself, she goes to Him. When she sees needs for others, she goes to Him. There is no part of Rose's life that does not include God ... and it is evident in her book. In her devotions, she includes verses of Scripture, which not only shows her knowledge of God's Word but teaches her readers how it relates to everyday life. Finally, the set up of the book drew me in. Her devotions are short but packed with information. She starts with a single Bible verse to introduce her devotion and ends with suggested scripture readings and thought-provoking journaling questions to keep her readers thinking about the devotion and growing in God's Word. As one who sometimes struggles when praying and talking to God, I really enjoyed the final three pieces in her devotions: Prayer, Today's Sweet Tea Moment, and Prayer Focus. These three sections give readers something to focus on outside of their own lives. Devotionals are wonderful companion books for your Bible, or wonderful to have available for the times you are waiting. In her new devotional, "God, Me, and Sweet Iced Tea," Rose Chandler Johnson helps her readers to "experience God in the midst of everyday moments." This book has a great title. It lets readers have a glimpse of what is inside. The book is about each person's relationship with God in everyday settings. Just as an iced cold glass of iced tea quenches thirst, studying God's Word qu Devotionals are wonderful companion books for your Bible, or wonderful to have available for the times you are waiting. In her new devotional, "God, Me, and Sweet Iced Tea," Rose Chandler Johnson helps her readers to "experience God in the midst of everyday moments." This book has a great title. It lets readers have a glimpse of what is inside. The book is about each person's relationship with God in everyday settings. Just as an iced cold glass of iced tea quenches thirst, studying God's Word quenches our thirst for more of Him. This devotional contains many wonderful topics with Scripture readings, questions, journaling ideas, a prayer with a prayer focus, and "a sweet iced tea moment." An example of that is, "Don't give up, your labor is not in vain." Examples of the devotions are: "Stop Complaining," Your Adversary the Devil," and "Train the Children. "These short, thoughtful, and encouraging devotions will become welcome refreshment for readers everywhere. God, Me & Sweet Tea by Rose Chandler Johnson is an encouraging and thoughtful devotional. Designed to encourage and impact believers from novice to elderly saint. More than reading a short thought and a scripture God, Me & Sweet Tea helps you set time aside to commune with Jesus. Each entry shares insights on a key verse that impacted her life. This is followed by two questions. One is a journaling question to help you apply everyday things to the scripture. The second question challenge God, Me & Sweet Tea by Rose Chandler Johnson is an encouraging and thoughtful devotional. Designed to encourage and impact believers from novice to elderly saint. More than reading a short thought and a scripture God, Me & Sweet Tea helps you set time aside to commune with Jesus. Each entry shares insights on a key verse that impacted her life. This is followed by two questions. One is a journaling question to help you apply everyday things to the scripture. The second question challenges the reader to apply the truth presented. And the chapter ends with a sweet tea moment and a prayer focus. The sweet tea moment is a thought to meditate on throughout the day. And the prayer focus is drawn from the scripture theme. Spending a few minutes each day reading the entry and exploring the scripture references feeds the soul with the Word. The few minutes it takes to fill in the answers to the questions help bring them to life. And the prayer focus and sweet tea moment helps our hearts commune with Jesus throughout the day. I love the personal stories Rose shares reminding the reader she has walked through these things herself. Opening her heart as she shares gives the feeling of sitting with her on a porch sharing a glass of sweet tea on a hot afternoon. It feels like the kind of moment where you sense a Divine Appointment with your Heavenly Father. If you are looking for a devotional to keep you on track with a daily quiet time this is a wonderful choice. One of the best devotionals I’ve read! I LOVE devotionals. I have read a lot of devotionals. Im picky when it comes to my devotionals. I want something that will challenge me and encourage me and teach me. I want something that will draw me closer to God and give me a deeper desire for His Word. God, Me, and Sweet Iced Tea fits the bill perfectly! I love the personal stories the author shares and the heart connection I felt every morning I spent time in this precious devotional. What I especially l One of the best devotionals I’ve read! What I especially love about this devotional is that you can customize it to your liking. If you want a quick devotional that you can use when you’re in a hurry- this is perfect for you, because each devotional is short but satisfying. But if you want to sit and savor each sip slowly…this devotional is perfect for you! The author has provided “Suggested Reading” Scriptures with each devotional to take your quiet time even deeper. Also included are “Journaling Considerations” with ample writing space for these soul-stirring questions. Each devo also includes extra goodies..
a prayer, a sweet tea moment and a prayer focus to help guide you into your own personal prayer time. If you have been looking for a devotional to help you grow your faith, look no further. God, Me, and Sweet Iced Tea will refresh, revitalize and renew your quiet time. In the South, nothing is more refreshing than a glass of sweet iced tea. Nothing, that is, except experiencing God in those small, everyday moments. God, Me, and Sweet Iced Tea is a deeply personal collection of spiritual treasures designed to help readers experience new mercies each morning. Seasoned with insight and grace, this tender devotional points to the divine presence of God in everyday moments. Whether purchased as a personal resource or given as a heartfelt gift, God, Me, and Sweet Iced Tea will help readers develop a daily habit of turning to God in those quiet moments of reflection. I won a copy of GOD, ME, AND SWEET ICED TEA in a giveaway, and for me, this is a great devotional for the hurried moments that all moms have. A scripture passage, a devotional, more scripture to read related to the topic, journaling questions (and lines to write on), a prayer, and the application. I enjoy keeping this book on hand for when I need a refreshing God moment. If you are looking for a devotional that is more than just a thought but less than a full-fledged study, then GOD, ME AND SWEET ICED TEA is one to consider. Only $2.99. $11.95 paperback. 169 pages. 5 stars. God, Me, and Sweet Iced Tea by Rose Chandler Johnson, a sweet and refreshing devotional is a blessing from the first page. As a devotional writer and Bible study leader, I need a devotional book that helps me see scriptures in a new light. I was not disappointed. Each day’s reading is based in a personal experience of the author, down-to-earth, and profound in their simplicity. The readings reveal the sincere needs of the writer’s heart in words that any believer can relate to. The reading is fo God, Me, and Sweet Iced Tea by Rose Chandler Johnson, a sweet and refreshing devotional is a blessing from the first page. As a devotional writer and Bible study leader, I need a devotional book that helps me see scriptures in a new light. I was not disappointed. Each day’s reading is based in a personal experience of the author, down-to-earth, and profound in their simplicity. The readings reveal the sincere needs of the writer’s heart in words that any believer can relate to. The reading is followed by suggested scriptures and “Journaling Considerations” which encourage the reader to dig deeper and write out the answers to searching questions. A simple prayer, based on the author’s heart-felt reaction to her own insights, and “Today’s Sweet Tea Moment” hone the message with precision to drive the point home for the reader. I enthusiastically recommend God, Me, and Sweet Iced Tea as a powerful aide to beginning your day with a godly outlook and encouragement to respond to the day’s circumstances as Jesus would. If you answer the questions and allow the messages to sink deep, your Christian walk cannot help growing. This simple little book is refreshing as a glass of sweet iced tea from start to finish. I was attracted to this because I often refer to my own time with God in the mornings as "God and me and a cup of tea." But mine is spiced chai latte Hey, I'm a northern gal and while I like my tea sweet - I also like it hot and combined with other spices. This devotional is also unusual because I'm still savoring it and enjoying it and it's not like a normal book to read and review where I was able to finish it on time. Well, I could have, because the chapters are short and, yes, sweet. Rushing I was attracted to this because I often refer to my own time with God in the mornings as "God and me and a cup of tea." But mine is spiced chai latte Hey, I'm a northern gal and while I like my tea sweet - I also like it hot and combined with other spices. This devotional is also unusual because I'm still savoring it and enjoying it and it's not like a normal book to read and review where I was able to finish it on time. Well, I could have, because the chapters are short and, yes, sweet. Rushing through though would defeat the purpose of letting a book like this help you reignite your walk with God. Rose set's this book up nicely with a scripture, devotional and then suggested readings and things to consider. I"m a gal who likes to journal and there is a little space in there for that. Probably not enough for me but since I have the e-book version, my thoughts go in my regular pencil and paper journal. It is followed by a brief prayer, a little "Sweet Tea Moment" and then a prayer focus. 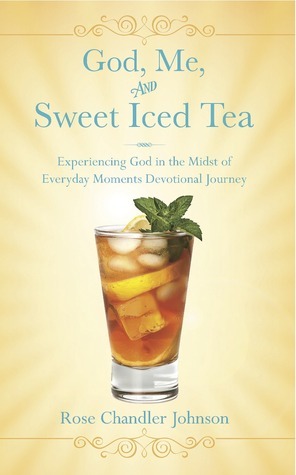 “God, Me, & Sweet Iced Tea;” what a captivating title! I enjoyed reading each devotional mixed with spiritual truths and insights born out of Rose Johnson’s personal experiences and faith journey. All the devotions were relevant to my life and to my faith walk with God. During one of my rare sleepless nights, imagine my astonishment when I picked up Rose’s book and opened it to the devotion where I had left off, “He Gives Sleep to His Beloved.” Indeed, reading this devotion and all others spo “God, Me, & Sweet Iced Tea;” what a captivating title! I enjoyed reading each devotional mixed with spiritual truths and insights born out of Rose Johnson’s personal experiences and faith journey. All the devotions were relevant to my life and to my faith walk with God. During one of my rare sleepless nights, imagine my astonishment when I picked up Rose’s book and opened it to the devotion where I had left off, “He Gives Sleep to His Beloved.” Indeed, reading this devotion and all others spoke to my heart. And, after reading that specific devotion that night, God immediately lulled me to sleep. The suggested scriptures for further reading, the journaling considerations, prayer, and iced sweet tea moments contributed to my own personal reflections as I meditated on each devotion. I recommend this book and I pray you will allow Rose Chandler Johnson to take you on your devotional journey for encouragement in your life and provide inspiration as you encounter life’s challenges. Every so often I really enjoy reading a good daily devotional book and God, Me, and Sweet Iced Tea by Rose Chandler Johnson hit the spot. This book is as refreshing as an ice cold glass of sweet tea (Pun intended). The author did a great job of developing a daily devotional which was easy to read and apply. Her format was excellent for applying it to your daily prayer time and journaling. I really found it helpful in renewing my personal prayer time. Rose Chandler Johnson book is a great devotiona Every so often I really enjoy reading a good daily devotional book and God, Me, and Sweet Iced Tea by Rose Chandler Johnson hit the spot. This book is as refreshing as an ice cold glass of sweet tea (Pun intended). Rose Chandler Johnson book is a great devotional for both new Christians who are just beginning their walk and for seasoned prayer warriors. Whether new or seasoned it is good to step back and take a fresh look at our prayer lives. I really like God, Me, and Sweet Iced Tea by Rose Chandler Johnson and highly recommend it to all readers. A great book! I especially found it helpful that at the end of each piece there was a prayer journal question to be answered. Rose Chandler Johnson is deep and honest in her own struggles. It is heartfelt her love for God and scripture points. I found it full and complete and I would recommend it to anyone who wants to get comfortable with God. She has made me realize what an enormous relationship we can have with God and how important it is to spend quality alone time in his word, devotions, an A great book! I especially found it helpful that at the end of each piece there was a prayer journal question to be answered. You Can't Possibly Go Wrong With "Sweet Iced Tea" in the Title! Refreshment for the Soul. God, Me, and Sweet Iced Tea is an insightful and thought-provoking devotional. I love to read it during times of stress-you know, during those times when I really need to sit down, take a deep breath, have a refreshing glass of sweet tea, and connect with my Creator. Straight from her heart, Rose Chandler Johnson has written a devotional that is refreshing to the heart, soul and mind. Take time for a sweet te You Can't Possibly Go Wrong With "Sweet Iced Tea" in the Title! Refreshment for the Soul. If your desire is to draw closer to God and find Him in the ordinary, everyday moments of life, this is a must-read. Rose Chandler Johnson writes from a pure heart of love and a lifetime of practical and personal experience. Grab a glass of sweet iced tea and settle in with Rose's book as you spend time with the Father. Rose brings Scripture to a practical and conversational level. If you do, indeed, just want a moment to sit down with a cold glass of iced tea (or whatever!) and talk to God for a bit, this book is a good help in that direction. I especially liked the journaling prompts. The story about her son in Iraq was particularly touching. I really enjoyed this devotional. There were great personal stories by the author that was mixed with Biblical stories. I also like that she gave the reader questions to go back and reflect on in the reading. This is a simple, but wonderful devotional that helps the reader to reflect on Biblical passages, but also their own life.